ln its unceasing pursuit of Honda, Yamaha sought to match the Gold Wing flat-four, which was enjoying an excellent reputation and which in 1982 had just been uprated to 1100cc. Perfected by Yamaha-USA, the Venture appeared in 1983 with a magnificent V-four engine that combined all the essential technical features such as chain-driven overhead-camshafts, 16 valves, four constantvacuum carburetors and shaft drive. Original in concepL- it was Japan's first big V-four - the Venture also broke new ground aesthetically with soft, flowing lines adding a light, elegant touch to its imposing bulk. Despite its mechanical qualities, the Venture never posed a serious challenge to the GoldWing, which was constantly evolving. When the Honda went to six cylinders in 1988, it dealt the Yamaha a fatal blow, even though the Venture gained a 1300cc engine. In Europe, the Venture also suffered by not having been designed for high speeds, at which its stability could become chancy. Its fore-and-aft coupled braking also needed improvement. In contrast, the Venture (or XVZ 121D, to give it its model designation) offered an irreproachable standard of finish, a high level of specification and outstanding comfort at an extremely competitive price. It's also worth noting that its power unit –with its formidable levels of power and torque - was also used on the Yamaha V -Max. 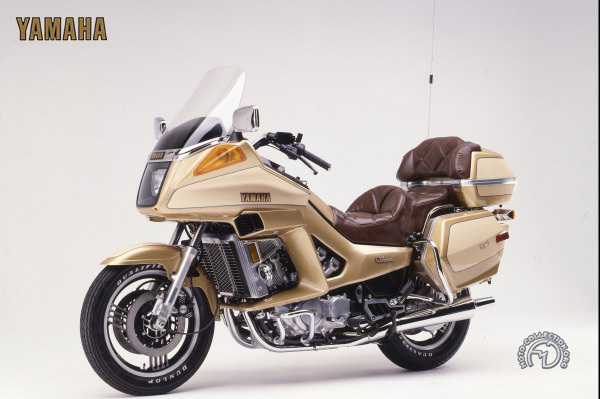 Despite its imposing dimensions, the Yamaha XVZ Venture was an outstandingly elegant bike.